Front row: Del Clements, Knute Cauldwell, Homer Stonebraker, “Bake” Bacon, Abe DeVol. Back Row: Coach Paul Sheeks, Lester Hunt, Sam Bliss, Manager. Stonebraker, center on this Wonder Five, came to Wabash from Wingate, Indiana. As a nod to his prowess in athletics, Homer was in the first class of inductees for the Wabash College Athletics Hall of Fame. In a neat connection to the team of 1907-08, described in the previous post, the assistant coach of the 1916-17 team was Abe Diddell who was a key member of the first Wonder Five. Wabash has had a wonderful tradition of passion for both basketball and football and that holds true yet today. As the month of November approaches, it seems like it is time to start thinking of basketball. This next series of posts will be focused on the “wonder five” teams of Wabash. Let’s start with the first team ever labelled a wonder five. 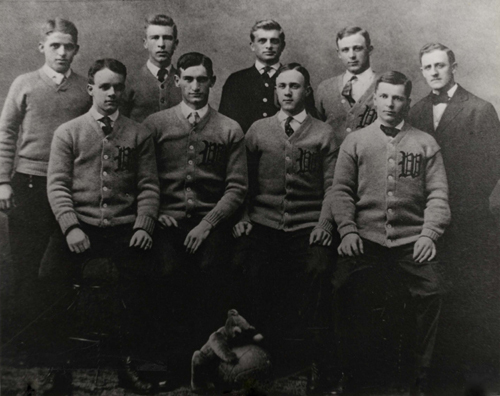 The basketball men of 1907-08 had a 24-0 season record. Front row: Ralph Wicks, Will Sprow, L.J.C. “Brandy Freeman, William H. “Abe” Diddell. Back Row: Charley Ball, Harter “Deac” Walter, Paul “Perry” Stump, Walter “Gypper” Gipe and Coach Ralph Jones. This team was one of four coached by Jones in Crawfordsville, the other three were the Crawfordsville High School team, the local business college team and the YMCA team. A very busy man, Jones also coached football – he eventually coached the Chicago Bears in the 1930’s. Among the players on this team is Abe Diddell who carved another legacy in sports following Wabash, although not in basketball. Abe will be a fitting subject for his own post about his career in golf. I should not close without noting that your eyes are not deceiving you, perched on the basketball in the team picture is a small bear, here is a close up of Teddy. 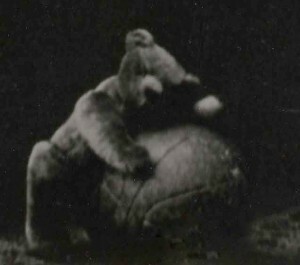 This picture was made at the height of the teddy bear craze in America. As the first of the wonder five teams at Wabash, this team with their 24-0 record was a tough act to follow. Next time I will share more information about the 1917 team and I hope you have enjoyed this look at the first of the Wonder Fives. As a part of their pledgeship Sphinx Club rhynies are directed to research a topic in the Archives. As a result of one young man’s interest in the Little Giant Room, we scanned this picture for his report. This image was taken from a pamphlet created at the time the building was finished. I thought it might be fun to post that picture along with this next one of the pool hall – now known as the Bookstore. As we see, the changes to both of these areas have been substantial. One place that has not changed is the Scarlet Inn. It is still the place to go for a bite to eat, a great cup of coffee and some good conversation. Quite a few legends in this picture – among others, Ed Haenisch ordering at the counter, young Ben Rogge looking right at the camera and that is Bob Harvey seated. I should add that the building was originally the Campus Center and later named the Sparks Center in honor of our President Sparks, the driving force behind the project. Enjoy this peek into the past! Image from the book Prudent Soldier about Canby by Max L. Heyman, Jr.
As a college for men, I suppose it is not too surprising that a number of our students have gone on to attend West Point. Among the men who have made this journey is Edward Richard Spriggs Canby – or, as he is more widely known, E.R.S. Canby. Canby was born in Kentucky and, in 1829, moved with his family to Crawfordsville. His father, Dr. Israel Canby, was appointed as Receiver of Public Lands. By May of 1834, young Edward was enrolled at Wabash. He attended for four terms before receiving his appointment to West Point. His brother, Charles, is also an alum of Wabash. Edward’s record at West Point did not indicate that this young soldier would amount to a great deal militarily. He finished next to last in his class at West Point, was commissioned a second lieutenant and sent off to Florida for the wars with the Seminoles. In the Mexican-American War Canby was promoted and by 1849 he was a major on his way to Monterey, California to serve as adjutant-general of the California Department. By the start of the Civil War, Canby was in New Mexico. It was a tough time in the army as many who had served together now found themselves on opposite sides of the war. Canby’s commanding officer – Henry Sibley, who was also his brother-in-law – had left New Mexico and gone to Richmond, Virginia to offer his services to the Confederate States of America. This offer was accepted and General Sibley returned to New Mexico to face young Canby, now in charge of the defense of the territory. Although Sibley won more battles, Canby’s strategy proved successful. The Confederate troops were denied supplies and were unpopular with local residents. Following the big battle of Glorietta Pass in 1862, in which Canby’s administrative gifts were key to the success of the northern troops, the Canbys were on their way back East. Canby served in various administrative positions including time in the War Department under Edwin Stanton. Among the tasks assigned was to bring order to New York in the wake of the draft riots in the city. This he did and was rewarded with a field command as Commander of the Division of West Mississippi. His goal was to re-take the last Rebel port on the Gulf – Mobile, Alabama. Working with Admiral Farragut, Mobile was taken. On April 12, 1865 the Rebels in Mobile surrendered. 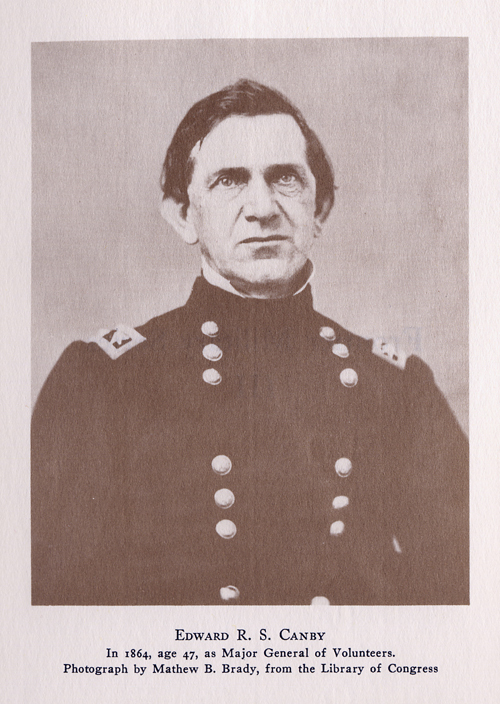 Canby was ordered west in time to receive the last surrender of an army in the war by General E.K. Smith. Canby then worked in the reconstruction of the South, but his leniency with southerners was a problem. Canby was ordered back to Washington, D.C. where he served until the late 1860’s, when he volunteered to return to the West. Ulysses Grant sent Canby to the Department of the Columbia – which included Oregon, Washington and Alaska – to help with troubles between the Modoc natives and the settlers in the area. By 1872 the term used was “Modoc War”. From what I gather, Canby was a well respected officer. In April of 1873 Canby was working to establish a peace in the area. He arranged a peace conference with the Modocs and to show his good faith attended unarmed. It was at this conference on April 11th that General Canby and the other members of his peace party were killed. His body was shipped back to Indiana and he was buried in Crown Hill Cemetery in Indianapolis.